This corridor has potential to be one of the longest corridors. It serves the First Ward, South Buffalo and Lackawanna. 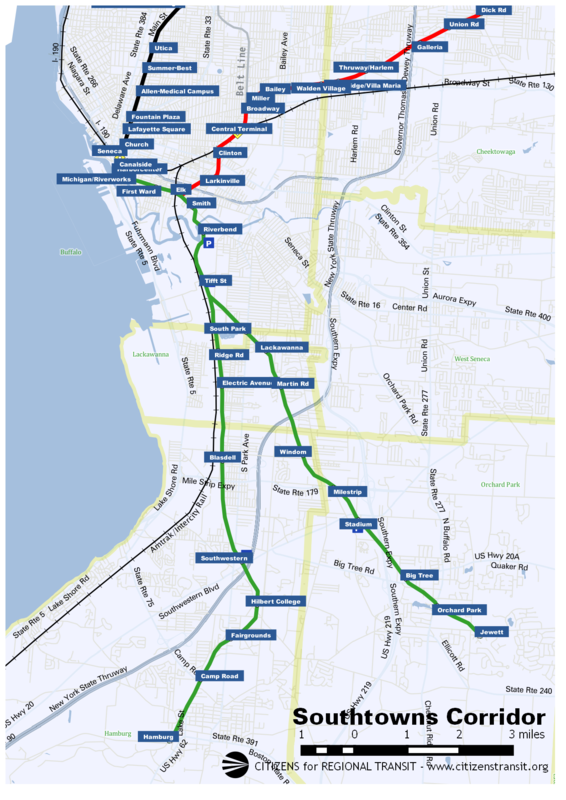 The route begins on the old City Branch from the D,L&W Terminal (Metro Rail Yard and Shops) along South Park Avenue. After crossing the Buffalo River, the route splits into two branches. The two branch options; one to Orchard Park (and thereby servicing Ralph Wilson Stadium) and one to Hamburg, service the village and town as well as the Erie County Fairgrounds. The downtown portion of the corridor is co-located with the Heritage Trolley Corridor, which traverses the City Branch to Lee Street, where the Western New York Railway Heritage Society's Discovery Center is located.